Sow the seeds during February and March because this is when the growing season starts. If you want to sow in another month of the year, create an artificial environment and make sure that you keep the temperature between 18º to 22º C (65º to 72º F). 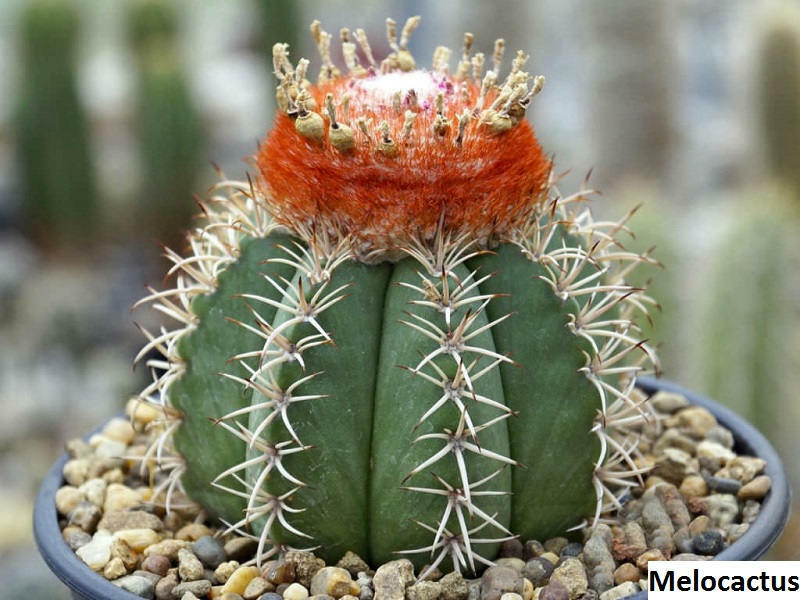 The Melocactus are not easy to grow, for that reason, it is recommendable to plant the seeds in a pot directly instead of a seed tray, though, if you prefer to sow in seed trays you can do it at your own risk. The soil must be 95% of pumice or any other inorganic material that helps with the drainage, the other 5% must be a cactus mix, or if you are unable to find the cactus mix, you can use potting mix. Besides that, do not forget to sterilize the soil before sowing, and if you are using pumice, it would be good if you wash it off before mixing it with the cactus mix. Add plenty of water and leave the container, so that the water has some time to decant. Once the seedlings appear to remove the cover and put the seedlings into the sun so they can get accustomed to the direct sunlight, do not forget to do this gradually, never put the seedlings at one time, they need to get accustomed first. A few minutes daily in the sun will do it when they are accustomed move them from their current place. If you sowed in a seed tray, once the seedlings are 10 cm (4 in), it is time to transplant. Remember to sterilize the new substrate as well as garden tools, and also do not forget to remove the old substrate from the roots. Watering: dislike others succulents these plants need a fair amount of water due to their tropical origins, though, you must maintain a balance because if you overwater them, it will cause rotten roots and your plant will die. During the summer they demand more water, make sure that before every watering you allow the soil to dry. In winter, watering once a month should be enough, but if your plant has the soil extremely dry, you must forget the rule of once a month and water it. Light: direct sunlight is the perfect environment for Melocactus, however, if you can’t provide your plant with the light of the sun, put it in something like a windowsill. Some countries have a quite intense sun, so much so that it may cause sunburn, in these cases, you should place your plant in shadow with plenty of light and air. In winter they need direct sunlight but be aware of the rainwater does not fall on your plants or they will get rotten roots. Temperature: they prefer warm temperatures, the adequate should be more than 21º C (70º F), and the Melocactus can’t stand frosts. When frosts arrive put your plant indoor, and if the environment is still very cool you may use a heat mat. Some people do not have a heat mat, and they put their plants near the back of the fridge or cooker. They will develop very well if you feed the plants during the growing season. Use a proportion of 20-20-20 mixed in water. Pests and Diseases: apart from rotten roots and dark spots, these plants are quite resistant. Something that may occur is the appearance of mealybugs, and snails. If this happens, use a light insecticide.